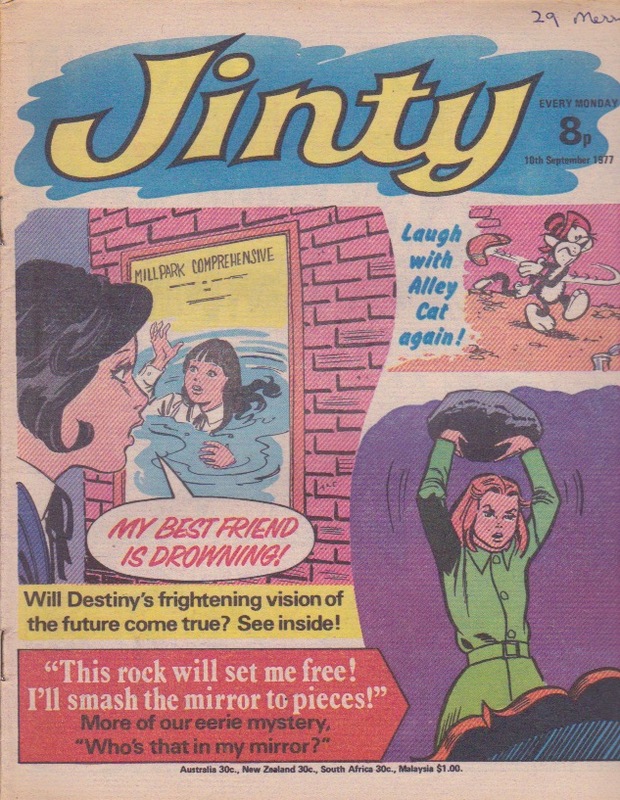 Lindy was the first comic to merge with Jinty. But how did she start off originally? What was in her first lineup? I do not have the first issue, but I do have the second, which came with a bottle of perfume as its free gift. Lindy’s favourite perfume, apparently. I wonder what scent that was? 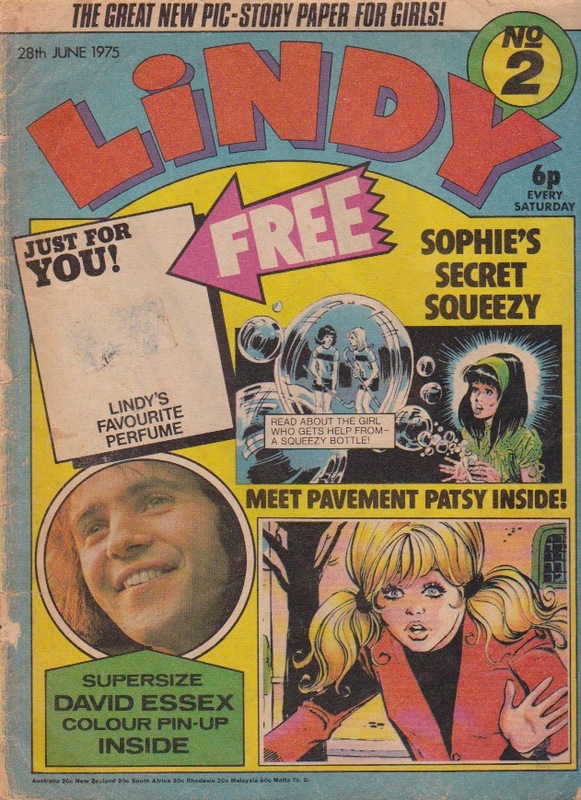 I suspect my copy is lacking a couple of pages (at the “Jane’s Jeannie” section), most likely because someone took out the David Essex pinup, so it is possible that the lineup I have listed here is not quite complete. If someone could clarify this with a complete copy, please leave a comment below. New IPC titles of the 70’s started off with a Cinderella story and a slave story in their first lineups, and Lindy is no exception. The Cinderella story is “Pavement Patsy”, where Patsy Logan puts up with her horrible aunt and uncle so she can stay together with her little sister Jenny. She is their drudge and obliged to go on on her uncle’s coal round. The aunt and uncle are as mean as Scrooge too; in this episode Patsy asks her aunt for money to buy a new pair of shoes for Jenny, but all the aunt will cough up for it is five pence for something at a jumble sale, which results in shoes that don’t fit properly. There is usually some hobby or passion that provides solace; in Patsy’s case it is pavement art, and words of praise from a tramp encourage her to believe that her art is going to be more than just a hobby. But you can be sure the horrible guardians are going to get in the way. 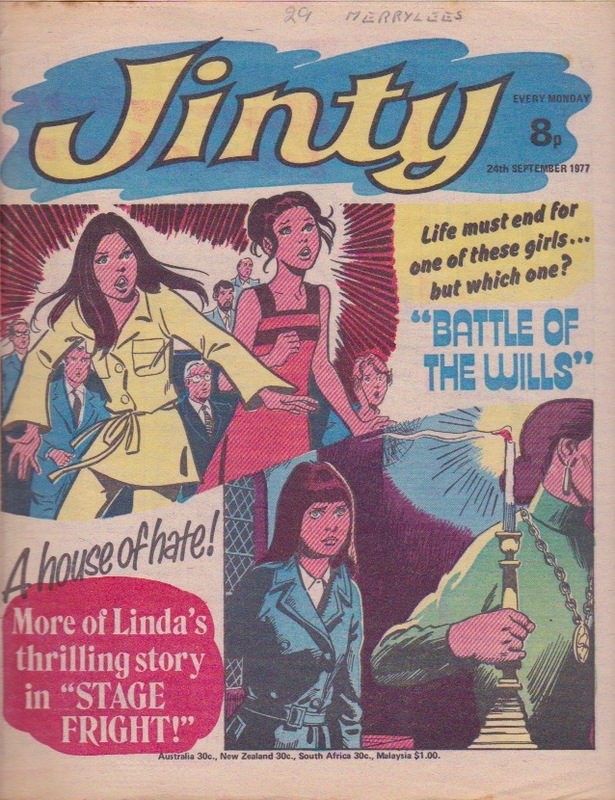 The slave story is “Nina Nimble Fingers” (reprinted in Jinty Holiday Special 1981). The slaving is set in a Victorian dress shop, where Nina Sinclair and her sickly younger sister Clare have ended up as apprentices after their mother’s death. We are into part two, and Madam Estelle, the owner of the shop, has now established to the Sinclair sisters just what a hard, cruel woman she is to work for. She even takes off money that Nina has earned for herself and badly needs in order to get medical treatment for her sister. But it also establishes the to-be-expected determination of the heroine not to give in to such cruelty and ultimately rise above it. Supernatural stories are part of the parcel as well, of course. In this case they are “Sophie’s Secret Squeezy” and “Jane’s Jeannie”. Jeannie is the more lightweight one, played for humour. Jane makes friends with a genie called Jeannie. But instead of a bottle, Jeannie pops out of a tennis racquet! That sure makes a change. Sophie has been down on her luck until she acquires a squeezy bottle and now feels different about herself. Every time she makes bubbles, she sees visions in them that help her immensely. In this episode she is framed for stealing, but the squeezy bottle shows her who and why; it was a girl who was embittered because her mother will not allow her to join the hockey team. How will the squeezy help her to sort out the problem, and in a way that helps the girl? Presumably the story lasted until the squeezy bottle ran out. A scary story is always popular, and so Lindy has “The House of Fear”. Harriet has gone to stay at her aunt’s and the only residents are the servants who are trying to scare her off with claims of hauntings. As if they need to fake ghosts – the butler looks like Frankenstein’s monster or Lurch from the Addams Family. And by the end of the episode, Harriet suspects they are holding her aunt prisoner in the cellar. But I wonder if Lindy is tipping her hand way too soon with this one – it’s only the second episode and already Harriet is convinced the servants are trying to scare her off. Shouldn’t the story be allowed to develop more before she begins to suspect them of that? “Hard Days for Hilda” is a maidservant story, but set in the 1930s rather than the more usual Victorian times. 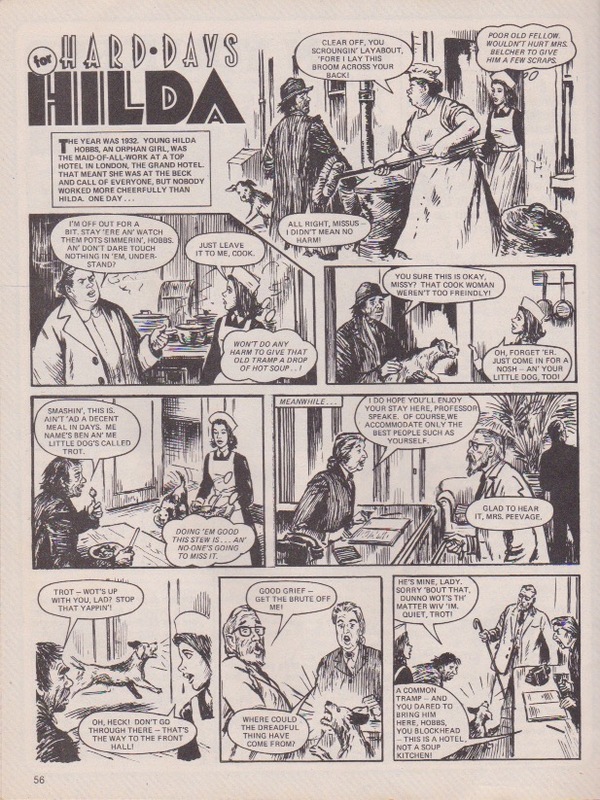 Hilda Hobbs takes the lowest maidservant job at The Grand Hotel (makes a change from aristocratic residences like Molly Mills’ Stanton Hall) though she doesn’t let it get her down and remains chirpy. But in the second episode she finds her days getting harder when she finds the other maidservants are spiteful and play tricks to get her into trouble, and there is the typical bullying from senior staff. But there is always one servant who is friendly and Hilda finds him in this episode as well – Willie the Buttons Boy. 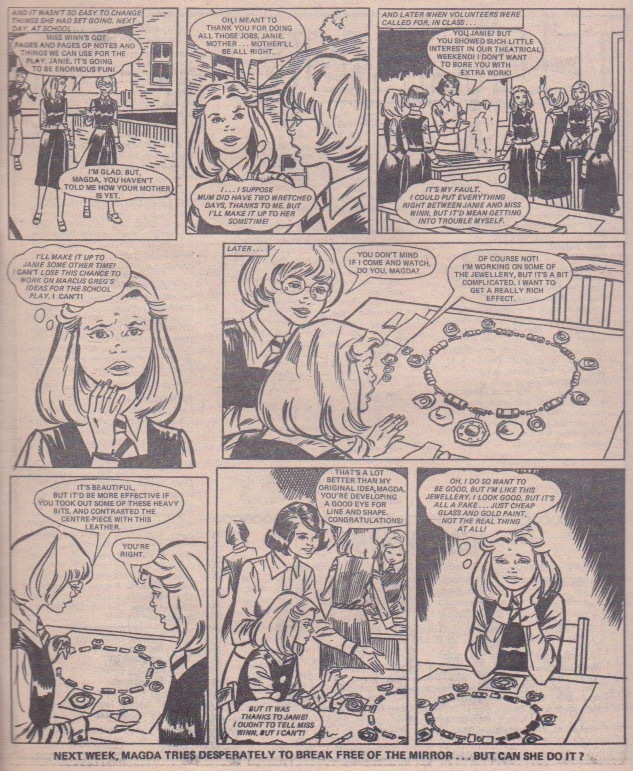 I have found on UK Comics Wiki that it was written by Terence Magee, a stalwart at writing stories about tortured heroines at all sorts of cruel institutions ranging from schools to reformatories, including Jinty’s own “Merry at Misery House“. In “The Last Green Valley”, Lindy seemed to anticipate Jinty in featuring environmental stories. The environmental issue in this case is Britain being plunged into an ice age, and our band of survivors are making their way to “the green valley”, an oasis that is supposed to have escaped the ice age. Finally, there are “The Tin-Mine Ponies”, where the snobby Mrs Gore-Bradley threatens the rehoming of ponies at a pony trek centre because she wants to keep the countryside to herself. She is outsmarted in this episode but is still determined to get rid of “those ghastly ponies”, and it won’t be for lack of trying. Hilda and Patsy were the longest-running stories from the first Lindy lineup; Patsy finished in #18 and Hilda in #19. This indicates they were popular while they lasted, perhaps among the most popular. In summary, it can be said that Lindy got off to a promising start, with Norman Worker at the editor’s helm. 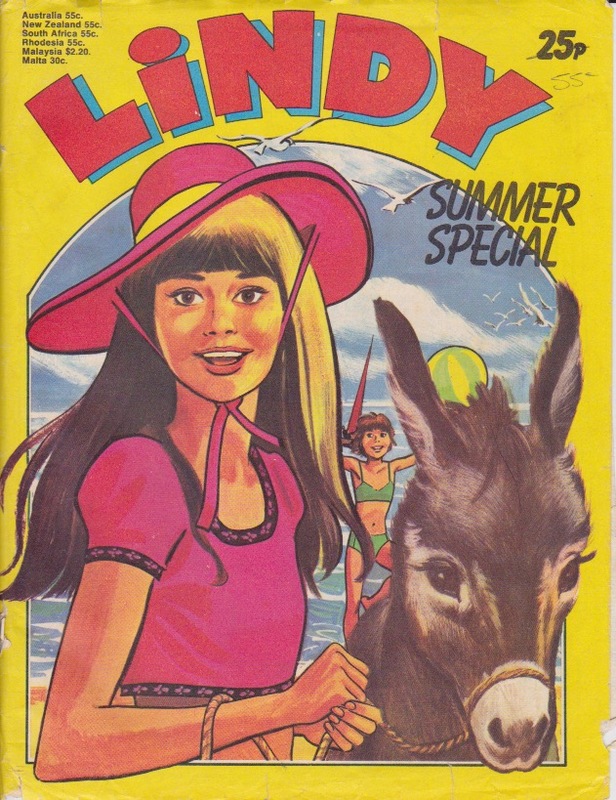 Lindy’s stories were filled with the ingredients (hardship, cruelty, humour, supernatural, friendship) that made the early Tammy and Jinty popular. There were even some surprising takes on established formulas, such as the genie who popped out of a tennis racquet. However, her lineup lacked humorous regular characters (a la Tansy of Jubilee Street or The Jinx from St Jonah’s); the only character in that area was the Penny Crayon cartoon, which made her the only Lindy character to carry on in the merger. She also lacked regular characters in general, a deficiency that is always means a girls’ comic fades fast once it goes into a merger, because it is the regulars and cartoon strips that carry on in a merger. So although Lindy’s first lineup showed potential, it exhibited deficiencies that would be telling once she merged with Jinty. Had she lasted longer, the deficiencies could have been addressed, more regular characters introduced, more serials that could still be well-remembered, and Lindy herself remembered more. Instead, she was short-lived (only 20 issues), even by the standards of short-lived girls’ comics, and is largely forgotten. A cover featuring two of the supernatural- themed stories running in Jinty at the time, both with foreboding overtones. The panel featuring laughs with Alley Cat is quite a contrast. In “Destiny Brown”, people are ostracising Destiny because her father has been connected to a robbery and bullies pick on her at school. But their bullying puts a girl’s life in danger – as Destiny foresaw with her second sight. In “Who’s That in My Mirror?”, Magda smashes the mirror in the hope this will free her from that ugly face that is a reflection of her own devil heart. But she is puzzled as to why the mirror is putting up no resistance to being smashed after resisting her attempts to get rid of it. Perhaps she should have taken the hint and put the rock down. But instead the drama of the story is going to accelerate towards its climax. “The Goose Girl” learns why her mother hates birds. And now all readers must be more annoyed with the mother than ever. Hating all birds because her husband was shot while defending them from hunters? And now she’s helping those very same hunters who killed her husband? That woman really needs to get her head examined! Unfortunately that’s not going to happen, and her attitude is going to cause even more problems. Marnie tries to get the curse lifted in “Cursed to be a Coward”. But instead she ends up with Madam Leo terrorising her over it and scaring the living daylights out of her just as she is about to do a high dive. Not a good combination, and this is just what that demented Madam Leo intends. Another Jinty character in serious need of a psychiatrist. Fran the Fixer ropes some girls into shifting the grand piano for the Colonel. And she fixes a half holiday for the girls into the bargain! It’s the last episode of “A Boy Like Bobby”. Next week Phil Townsend starts on his new Jinty story, “Stage Fright!”. Jinty is keeping her artists busy again. “The Battle of the Wills” is put aside as the ballet Kate goes in search of the gymnast Kate, whom she thinks is in trouble. And she finds out how much Dr Morrison really cares about the cloned Kate; as far as the doctor is concerned, it’s “just an interesting experiment”. But little does ballet Kate know how much it is a foreshadowing of one of the most cold-blooded acts ever to be seen in girls’ comics. Magda Morrice has the face of an angel but the heart of a devil. She schemes her way to anything she wants and her pretty face belies it all to everyone. She gets jealous when Janie Gray wins the third form prize for fashion design and deliberately puts a dent in it. She then quietly takes the trophy from Janie, under pretext of having it mended. Later, at the market, she tricks her way into acquiring a mirror she fancies. But when Magda gets the mirror home, she is surprised to find that the mirror is reflecting two images of her! She does not realise that the second face is actually a reflection of the devil in her – not yet, anyway. The reflection takes a hand in helping Magda with her schemes. These are designed to take advantage of Janie and pretend to be friends with her while stealing Janie’s work and passing it off as her own, while sabotaging Janie’s other work to make her look bad in the eyes of their fashion teacher, Miss Winn. She also pretends to Janie that her mother is ill (and even gives her mother a dose of food poisoning to complete the effect) in order to pull Janie’s heart-strings and cadge off her for things such as a sewing machine. And she is very slick at pulling the wool over the eyes of Miss Winn, who thinks she is improving marvellously while Janie seems to be losing it. But while the face continues to help Magda, it also grows increasingly ugly, evil-looking and frightening. Magda catches on to what is happening in the mirror and tells the reflection that she is going to change so the reflection will be pretty too. But the reflection just sneers at her – and it is right. Magda soon finds she cannot change the things she has started without getting into trouble. Besides, she has gained things out of them, such as receiving accolades from Marcus Greg, a famous theatrical designer. She is soon lapsing into her scheming ways. Now Magda has had enough of the terrifying face and tries to get rid of the mirror. But it always finds its way back to her – more of its powers. So Magda smashes it instead. She is puzzled as to why the mirror does not resist her as she throws a rock down on it. But she soon finds out! Far from ridding herself of the face, she finds the face is following her everywhere! Every time she looks a mirror, pane of glass or anything reflective, she sees that face. It is getting uglier by the minute, and bigger too. It is such a nightmare that Magda can’t sleep and isn’t brushing her hair because of that hideous reflection in the mirror. People notice what a state Magda is in but of course Magda can’t explain why. The only way out seems to be to confess, but she is too caught up in what she has started to change anything now, and not with accolades from Mr Greg in person. Morever, she can’t quite work up enough courage to confess. And there are still traces of Magda’s selfish, scheming old ways left in her. Eventually she gets so afraid of discovery that she takes her latest work and Janie’s (some costumes) to school with the intent of destroying the evidence. But it is then that the worst happens. The pile of costumes suddenly comes alive, and it has that hideous face for a head! The strange monster is now coming towards Magda and seems to be about to speak to her. Magda is so terrified that she faints. When she comes to, Miss Winn is standing over her. Magda is so terrified that she finally makes a full confession to Miss Winn, Janie and then her mother. Miss Winn is all for punishing Magda (if only she knew), but Janie is forgiving and still wants to be friends. Magda returns the trophy she tricked Janie out of. As it has to go back at the end of term, she decides to buy Janie a replica she can keep forever, as a way of making it up to her. When Magda next looks in a mirror, she finds the hideous face has gone. Hers is the only reflection now. But she resolves to be as good as she looks from now on – in case it comes back. Now this is one story that takes established formulas and does a take on them to give us something fresh and different. The first is what I call “the sweet-faced schemer” formula. Cunning schemers who get away with murder because they look so pretty, angelic and innocent have abounded in girls’ comics. They cropped up regularly in DCT titles, such as “Move Over, Maria” (Bunty) and “The Truth about Wendy” (Mandy). Sometimes they have been regulars, such as “Angela Angel-Face” (Sandie). Perhaps the most cunning sweet-faced schemer of them all was Carol in Jinty’s “Concrete Surfer”. This schemer was so cunning that not even her victim, Jean was sure if she was a real schemer or victim of misunderstandings until the climax of the story where Carol finally slips up. The general focus in these stories is to catch out the schemer, and it is not easy. They are so slick, manipulative and innocent-looking that they have everyone around their little fingers (or play tricks to put them out of the way). But here the focus is on reforming the scheming girl and making her as nice as she looks. And here is the second thing that is unusual about this story. Stories dealing with turning unsavoury girls around usually deal with girls who are spoiled, selfish, snobby or arrogant. Seldom do they deal with a girl who is downright nasty or scheming. But this is the case here. And it is one of the rare serials I have seen where a sweet-faced schemer does change her ways. Usually they just get caught out at long last and are expelled or whatever. The third is the evil influence formula. Instead of forcing a nice girl into doing terrible things, which is what normally happens in evil influence stories, the influence actually seems to be helping an already nasty girl with her machinations. 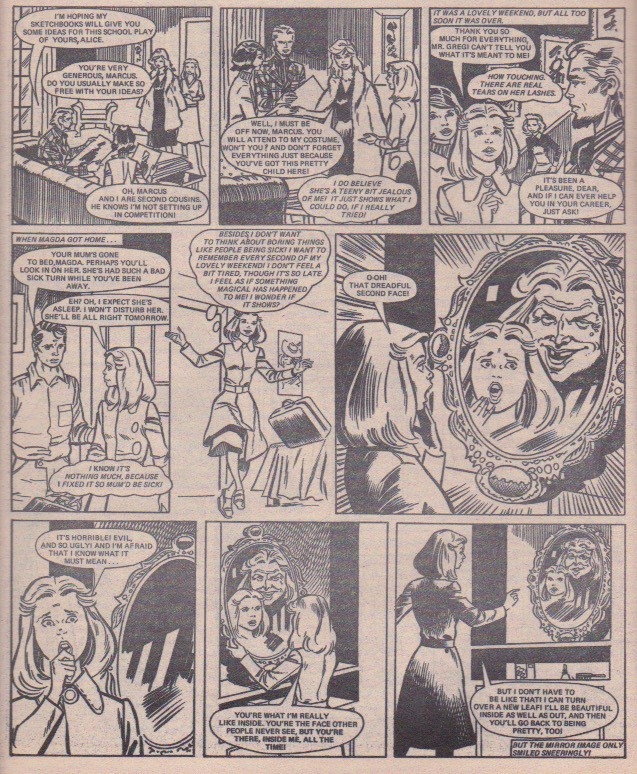 In the early episodes, readers may have felt a sense of outrage at the mirror helping a scheming girl. Shouldn’t she be getting her comeuppance or something from this mirror? But as the face grows increasingly hideous, readers must have reconsidered and wondered if this story would go the comeuppance way after all. Magda’s reactions to the image are realistic in that she doesn’t change all at once. One reason for this is that she doesn’t quite know how without getting herself into trouble. Another is that her old ways keep resurfacing. She tells herself that she will have to make up for things some other time, but of course that is just bandaid treatment for a rousing conscience and does not stop the evil image from haunting her. It continues right up to the end, where Magda decides to destroy the evidence – but it is then that the evil image threatens to do its worst. Magda realises she must act now, or goodness know what might happen. The intentions of the evil image are a bit confusing. The evil reflection encourages and abets Magda’s own evil. Yet at the same time it seems to be scaring Magda into changing her ways with its deteriorating, frightening appearance. It is not like other evil mirror stories that have appeared over the years. Girls either see a reflection in the mirror that is not their own but means big trouble (such as in “The Venetian Looking Glass” and “Slave of the Mirror” from Jinty), or the mirror creates evil reflections that set about taking over (“The Evil Mirror”, Girl series 2). But here the reflection is a reflection of the girl’s own evil that seems to start off helping her and then progressively scares the living daylights out of her. Furthermore, other stories where an object reflects a girl’s evil tend to do so in a reproving manner. One example is Mandy’s “Portrait of Pauline”, where Pauline’s new portrait starts reflecting her selfish nature and then her progress and setbacks in changing her ways. But this is not the case here. Rather, the image reflects Magda’s evil in a manner that flourishes in Magda’s evil. Maybe the answer lies in what would have happened if the image had spoken to Magda in the end, or if Magda had not confessed. But we never find out because Magda finally does the right thing in the nick of time. What was the purpose in a magic mirror that behaves like that? Is it an evil mirror that feeds off people’s evil? Is it a magic designed to punish evil people in a rather unorthodox manner? Was it the result of magic that went a bit wrong? Was it designed to be some “monkey’s paw” thing? Or was it something else? We never know because the origins of the mirror are left unexplained and the image never speaks to Magda – assuming that was its intention in the final episode. Still, it’s a different take on the evil influence theme, and we like the serial for that. The theme of an unpleasant girl being haunted by evil-looking faces that turn out to be distorted reflections of herself – or perhaps reflections of the evil inside her – has cropped up in the “Strangest Stories Ever Told”. 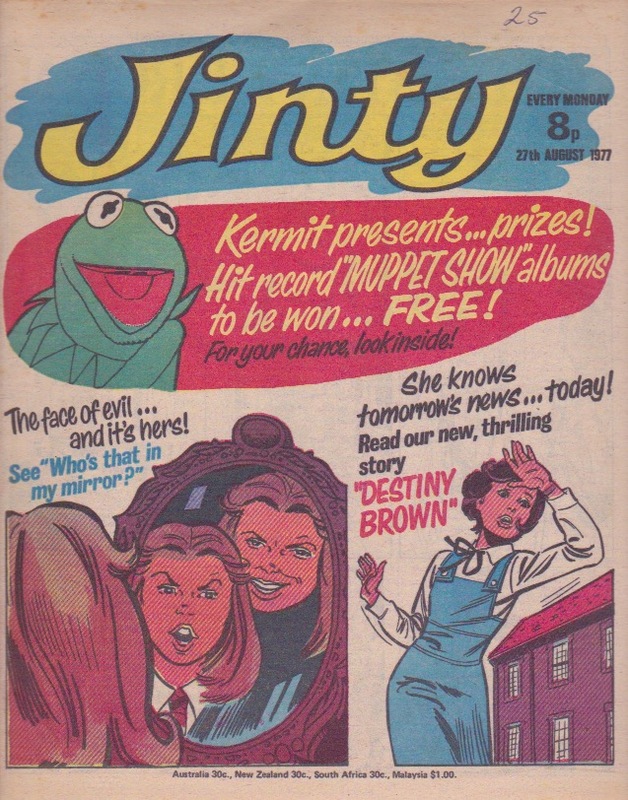 “The Face of Greed” (Tammy 4 October 1975; reprinted as a Gypsy Rose tale in Jinty 8 November 1980) and “Marcia’s ‘Ghost’” (Tammy 22 March 1980) are two examples, and there are probably more elsewhere. But those were complete stories. This is one occasion where I have seen the idea explored in a serial. The art has been credited to Tom Hurst following Ruth’s comment below. Note: This is the only Jinty story drawn by Tom Hurst. 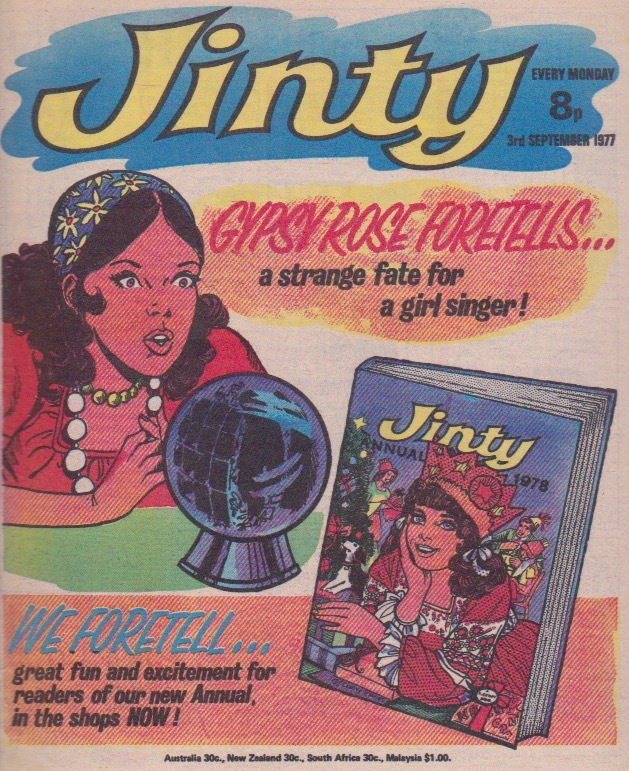 A strong cover which makes effective use of purple, orange, red and green in both panels to announce the return of Gypsy Rose and the appearance of the 1978 Jinty annual. The theme of foretelling and prophecy-making established on the cover runs through in several of the stories. “Destiny Brown” foretells a bank robbery – but does not foretell her father will be accused of complicity in it and is now wanted by the police! The “blue water” prophecy in “Cursed to be a Coward!” is making Marnie more and more terrified of water and everyone is getting fed up with her because they don’t understand her problem and she won’t explain. At the end of the episode, Marnie resolves to fight back at the curse of drowning apparently laid on her by the sinister fortune teller who could be the antithesis to Gypsy Rose. But how do you fight a curse? And in “Who’s That in My Mirror?”, Magda finally realises the evil face in her mirror is reflecting her scheming nature and resolves to change. But she gets a sneering warning from the face that it won’t be as easy as that, and this also proves prophetic. Elsewhere, it’s part two of the “The Goose Girl”, and now we see why the story is called that when Glenda and her mother move to their new home. Glenda takes a stand against goose hunters (little realising how history is repeating itself there) and starts nursing a goose they wounded. For “Fran’ll Fix It!”, Fran is presented with a really challenging fix – shifting a grand piano to the music shop in town for Colonel Wellington, a school governor. And she has to do it without a truck because of a strike. But it’s that or be punished for giving him cheek and then dropping a bell on his foot. Fran is known for dropping clangers with her fixing, but that’s ridiculous…. In “Sue’s Fantastic Fun-Bag!”, Sue and Henrietta also do some fixing – on a twister who sells phoney magic plant food. Henrietta fixes him in an unusual ‘punishment fitting the crime’ way – making him think his potion really does work magic on plants! A friendly girl finally discovers that there are two Kates in “Battle of the Wills”. It’s still not clear which Kate is the original and which is the clone. But at least the feud between the two Kates is set aside when one Kate realises the other Kate is in trouble and decides to help. It’s the penultimate episode of “A Boy Like Bobby”. Tommy runs away and Tessa and Bobby’s hunt for him results in him putting himself in terrible danger. How will this end the story next week? The cover announces the start of one new story, “Destiny Brown”, but there is not even a mention of the other story starting, “The Goose Girl”. Presumably its space has been taken up by the competition being announced on the cover. Just answer two Muppet questions and you go into a draw to win a copy of the first Muppet album. But why is “Who’s That in My Mirror?” taking what could easily have been the space to announce the start of “The Goose Girl”? “Destiny Brown” is the seventh child of a seventh child, so it’s no surprise that she suddenly develops psychic powers. And we have a new ‘parent problem’ story with “The Goose Girl”. Glenda Noble and her mother have been feuding over birds for years; Glenda loves them while her mother hates them. Moreover, she is the sort of mother who won’t let Glenda be herself and keeps pushing Glenda in the wrong direction. But Glenda is a rebel and constantly defies her mother, so she’s more ballsy than most regular heroines in that she can stick up for herself and even get her own way. But not enough to make her mother see reason. Meanwhile, in “Battle of the Wills”, Kate Wills, who has been constantly rebelling against the grandmother who keeps forcing her into ballet, suddenly surprises herself by enjoying ballet for the first time when her new teacher arrives. If she is the original Kate, maybe she could stay that way forever. But is she? Dr Morrison says she is, while the other Kate, who has been told she is the clone, has gone into a state of shock and wandering in a daze. But Dr Morrison has been caught out in one lie already, so is her word to be trusted? In “A Boy Like Bobby”, Tessa is defying her mother too in order to help the boys, and manages to fool her. But new problems are not far off, of course. In “Cursed to be a Coward!”, Marnie’s hydrophobia is intensifying to ludicrous lengths. It is increasing her unpopularity at school, and she just won’t tell anyone what the problem is. And as the cover states, the face of evil gets worse in “Who’s That in My Mirror?” as Magda’s scheming intensifies. In fact, in this episode she deliberately gives her own mother a dose of food poisoning!